Last night, I spotted a lovely deep red Carlton at Clapham Common. And this morning, an unusual bike with red tubes and unusual cast lugs. I think it was an Alan. A double bouncing folder. Wivva big chainring. We saw a Dahon Mu on the train. It was folded, and had drop handlebars! 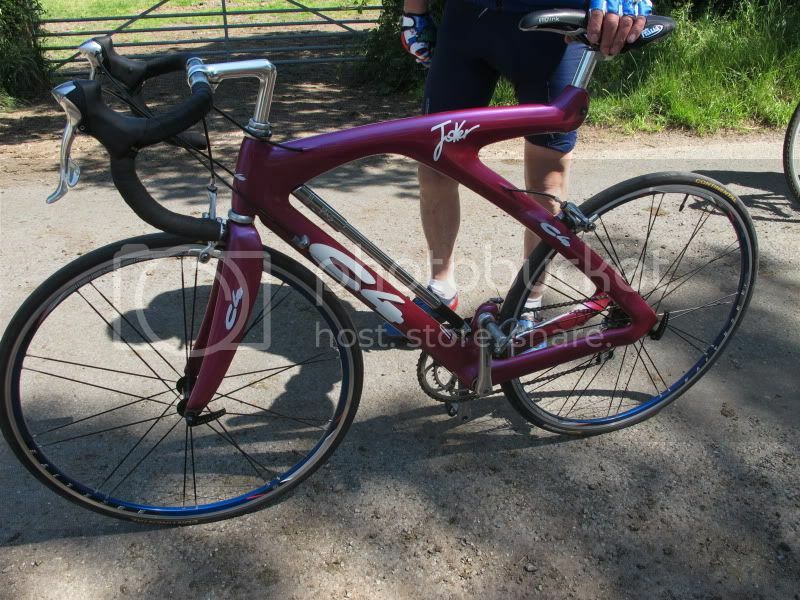 No photo, but I saw what looked like an MTB version of a Kirk Precision this morning. The frame was certainly a casting and it had 'magnesium' in decals on it. Was I imagining this ? You may have been imagining it, but Kirk did make an MTB. Kirk Magnesium on Flickr - Photo Sharing! A triplet, heading up Argyle Place as I was heading down with the empty tagalong rattling and bouncing behind me. Still doesn't mean you didn't imagine it though. I don't think my imagination is that creative. Unbadged fixer outside The Lamb last night. Looked like the frame was bamboo with the joints made by wrapping kit and kaboodle in carbon, but may just have been a poncey paint job. Scalped Overtook on the way to work this morning, a Giant Clip folding bike. Not seen one before. I got stopped at the traffic lights, and it just caught up as they changed so got a second cahance for a quick look for a name on it as I wasn't sure what it was. A non-descript bike in itself - didn't even see quite what it was - but with a number plate afixed to the rear rack, with the word DEAF on it. I may be imaging it, but I thought there was a German make (whose name escapes me) that makes a feature of the dual top tube. I had a long chat with the owner of one one morning. He loved it. It looked great fun actually. The guy who was riding it wasn't sure what it was - other than it is called C4 Joker and is Italian; he'd had it for years. Record brakes, Dura Ace drivetrain. Ah, I saw two of those on the L2B ride yesterday. The two chaps on them seemed to be motoring along quite nicely. I intended to ask them about the bikes but couldn't keep up. A Renault bike in Walthamstow on sunday. It was actually a decent looking bike for a car manufacturer but obviously just a badged far east made thing. Well, not a bike. But one doesn't expect to see someone on a unicycle in East Ham at 23:00. Or any time of the day/night, TBH. And it wasn't an Aldi/Lidl one, either. deeper than a deep thing rims. Handlebars cut down so they were narrower than the rider's shoulders . . .